Deviled eggs are on every Minnesotan potluck buffet table. I have an cousin who makes the best! 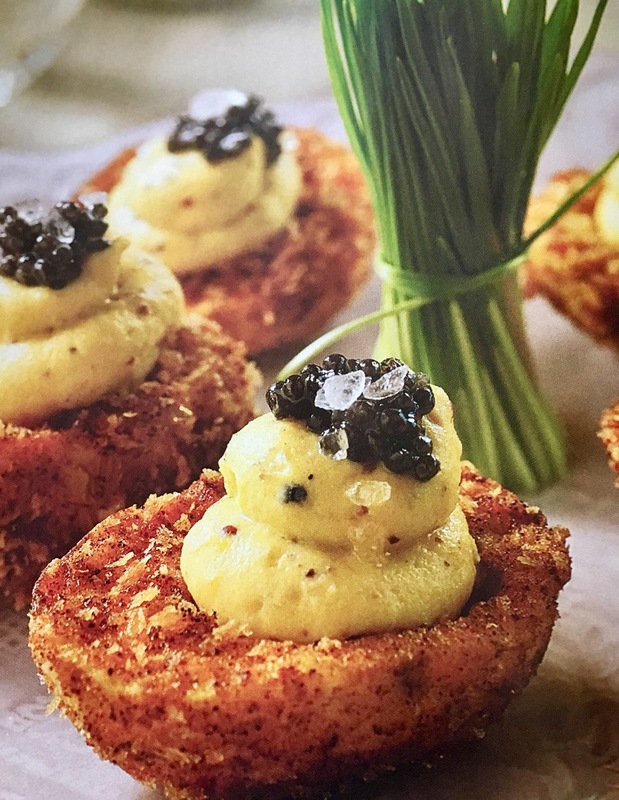 But thought I might want to try a fun and tasty twist on a classic appetizers. Directions: Bring water to a boil with baking soda. Add eggs and cook for 8 minutes. Chill eggs in ice bath, then peel eggs. Cut eggs in half. Remove yolks and placein a large mixing bowl. Set whites aside. Crush yolks and add garlic mayo, mustard, 1/2 tablespoon salt, hot sauce and pepper. Mix well. In another mixing bowl add flour, panko, 3 tablespoons salt, paprika and cayenne and mix well. Dredge whites of eggs in egg wash, then place in flour mixture. Fry egg whites at 370 degrees F for about 3 minutes, or until golden brown. Place fried eggs on a paper towel to soak up any excess oil. To serve, place fried egg halves on plate and pipe in filling. Top each egg with 1 teaspoon caviar and finish each with a pinch of truffle salt. Garnish plate with micro greens.